The long and winding road to 2019 Kentucky Derby glory is nearing conclusion. Now, with the prep season at an end, the focus shifts to getting those horses that have made the grade all set for the biggest race of their lives. It’s less than three weeks to May 4, the first Saturday in May and the $3 million Run for the Roses in Louisville. Intrigue remains as horses strive to step up conditioning while staying healthy and in-demand jockeys decide which horses they will ride. The final races yielding the valuable points Churchill Downs officials use to determine the 20 starting spots in the US’s most prestigious horse race were held Saturday. Richard Mandella’s slight favorite Omaha Beach — $5.40-$3.00-$2.80 — edged Bob Baffert’s Improbable. They are clearly far superior the the others contesting the $1 million Arkansas Derby at Oaklawn Park in Hot Springs. Earlier in the day at Keeneland Racecourse in Lexington, Owendale — $27.40-$10.00-$5.60 — bested Anothertwistafate and Sueno in the $200,000 Lexington Stakes. The Owendale win denies Anothertwistafate and Sueno the certainty of a Derby starting position because they both needed the winner’s 20 points from the Lexington win to crack the top 20 in the points standings. For a complete official chart of the Arkansas Derby click here. To view the official chart of the Lexington Stakes click here. Other horses along with Anothertwistafate and Sueno just outside the top 20 could still get into the race should any contenders ahead of them suffer a training setback or their connections decide not to enter. Tacitus (150 points) William Mott. Won Wood Memorial and Tampa Bay Derby. Omaha Beach (137.5) Richard Mandella. Won Arkansas Derby and Rebel Stakes. Vekoma (110) George Weaver. Won Blue Grass Stakes, third in Fountain of Youth. Plus Que Parfait (104) Brendan Walsh. Won UAE Derby, second in Kentucky Jockey Club. Roadster (100) Bob Baffert. Won Santa Anita Derby. By My Standards (100) Bret Calhoun. Won Louisiana Derby. Maximum Security (100) Jason Servis. Won Florida Derby. Game Winner (85) Bob Baffert. Second in Santa Anita Derby and Rebel Stakes. Won Breeders’ Cup Juvenile and American Pharoah. Code of Honor (74) Shug McGaughey. First in Fountain of Youth, second in Champagne Stakes and third in Florida Derby. Haikal (70) Kiaran McLaughlin. Third in the Wood Memorial and first in the Gotham. Improbable (65) Bob Baffert. Won Los Alamitos Futurity, second in the Arkansas Derby and Rebel Stakes. War of Will (60) Mark Casse. First in Risen Star and Lecomte. Long Range Toddy (53.5) Steve Asmussen. First in the Rebel Stakes and Remington Springboard Mile, second in the Smarty Jones and third in the Southwest Stakes. Tax (52) Danny Gargan. Won the Withers, second in the Wood Memorial and third in the Remsen. Cutting Humor (50) Todd Pletcher. Won the Sunland Park Derby. Win Win Win (50) Mike Trombetta. Second in the Blue Grass and third in the Tampa Bay Derby. Country Home (50) Bill Mott. Second in the Risen Star, third in the Arkansas Derby and fourth in the Louisiana Derby. Gray Magician (41) Peter Miller. Second in the UAE Derby and fourth in the Sham Stakes. Spinoff (40) Todd Pletcher. Second in the Louisiana Derby. Master Fencer (Japanese qualifier using special exemption). Koichi Tsunoda. Second in Fukuryu Stakes. For the complete standings for all horses earning points, click here. Early indications are that Omaha Beach (Mandella) is likely to be the slight race favorite over Tacitus (Mott) and Roadster (Baffert). All three trainers are enshrined in National Museum of Racing’s Hall of Fame. Two second place finishes in his two Derby preps appear to have slightly diminished Game Winner in the eyes of bettors. 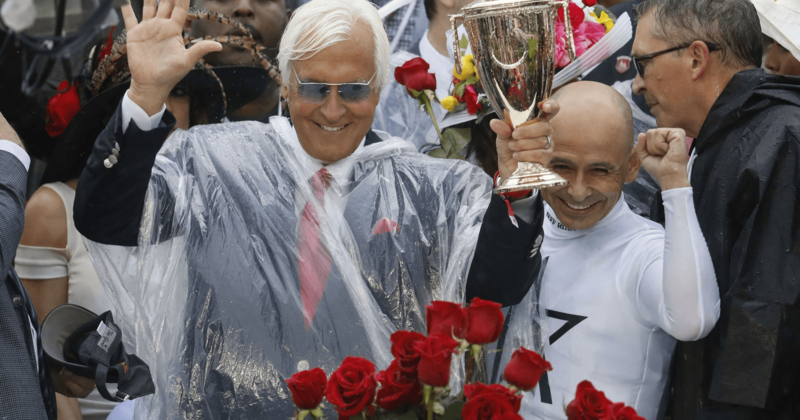 That Baffert pupil has been the presumptive Derby favorite since his 2018 two-year-old championship season. Adding to the usual intrigue this year, will be jockey Mike Smith’s upcoming decision as to which horse he will ride. He’s the regular pilot of both Omaha Beach and Roadster. Known as “Big Money Mike”, Smith, as of Monday, is still determining which will be his Kentucky Derby mount. Smith steered Baffert’s Justify to the Triple Crown just last year.